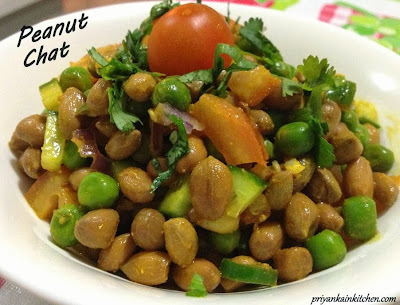 Chaats are very much part of Indian cuisine, full of spices and flavors. And when a chat is power packed with nutrition, it becomes irresistible. I have used boiled peanuts in this chat and believe me boiled peanuts have a taste that is totally different from anything else. Boil peanuts with salt for 20-30 mins in pressure cooker. Drain excess water and keep aside. In a pan heat oil. Add cumin seeds, green chilies and peas. Add turmeric, chili, coriander powder and salt. Cover and let it cook till peas are soft. Take out in a bowl and add tomato, cucumber, jaljeera and lemon juice.